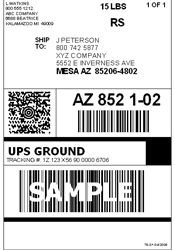 Always use UPS labels with the BRIGHT ORANGE “SATURDAY DELIVERY” sticker for packages being sent on Friday. Packages must have the bright orange sticker on them to move thru the sort hub and get to us on Saturday. Saturday is a normal work day. If you are getting low on either weekly or Saturday labels please contact the lab asap for more. (call 800-350-1122)When labpacks and padded pouches are needed order them through the lab. The supplies will be shipped directly from UPS. You can call 800-PICK-UPS to schedule a pickup. Always ask for the latest pickup time in your area to maximize daily coverage. Maximize our shipping discount program by placing all samples into one labpack. This will save your hospital shipping costs! Please avoid boxes unless they fit into the labpack. This will slow down the delivery of your package to later in the day and delay your results. Ice Packs are needed primarily when sending Adrenal panels, and T-4 testing. We request that you use a very small icepack to avoid additional shipping costs and avoid spillage / HAZMAT charges as well. If you are experiencing any difficulties with your UPS pickups, scheduling a pickup or communications with your driver please call the lab first. We have a very responsive and effective UPS support team to handle any issues that might arise.